I’ve recently taken on the role of Entomology Sub-group leader for the Larkhill & Westdown Conservation Group. 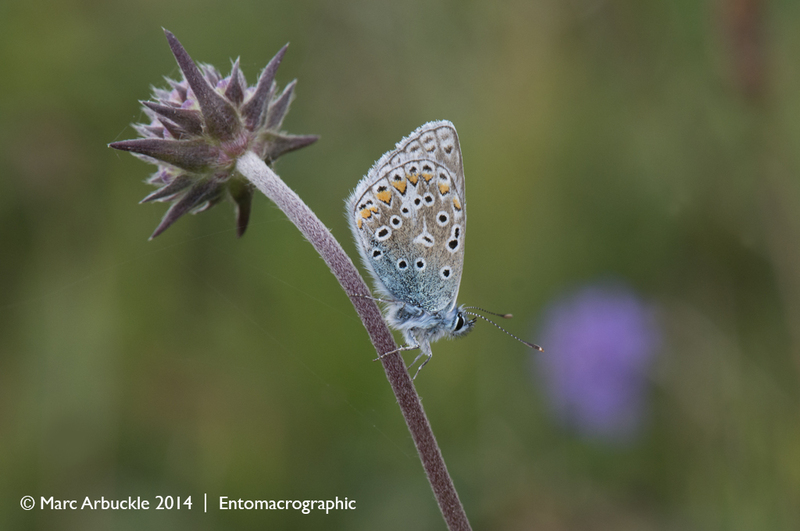 LWCG is one of three conservation groups that have access to some of the restricted areas of the Salisbury Plain Training Area (SPTA) which is where I took this photograph of a female Common Blue Polyommatus icarus resting on Devils-bit Scabious Succisa pratensis. The Plain occupies about one ninth of Wiltshire and is the largest remaining tract of calcareous grassland in North West Europe. It’s situated within the largest Military Training Area in the United Kingdom and contains about 41% of the UK’s ancient ‘flower-rich’ chalk grassland. The area I’m involved with, SPTA Centre, is largely an Impact Area where live-firing with artillery, mortars and other heavy weapons has taken place for a hundred years or so. Due to the impact of shells and sporadic burning the area is a mosaic of longer and shorter grasslands and has been largely abandoned agriculturally. It provides a much-needed refuge for rare plants like Purple milk-vetch Astragalus danicus, Tuberous thistle Cirsium tuberous, Meadow Clary Salvia pratensis and Juniper Juniperus communis. Rare birds like the Stone Curlew Burhinus oedicnemus, the Great Bustard Otis tarda, Nightingale Luscinia megarhynchos and overwintering Hen Harriers Circus cyaneus. Plus rare insects like the Shrill Carder Bee Bombus sylvarum and the Marsh Fritillary butterfly Euphydryas aurinia. In 2002* a select survey of invertebrates revealed 849 species including 64 nationally scarce and 18 red data book species. I’m really looking forward to seeing and recording what’s out there. *Source: Edwards 2002. An Insect Survey of Selected Sites within ATE Salisbury Plain 2002. Entec Ltd. Report to Defence Estates. Yes it’s very active and there is live-firing taking place on average 340 days per year. Of course conservationists can only go in to the restricted areas on non-firing days having gained prior permission from the Ministry of Defence. And this is only after a thorough safety briefing.